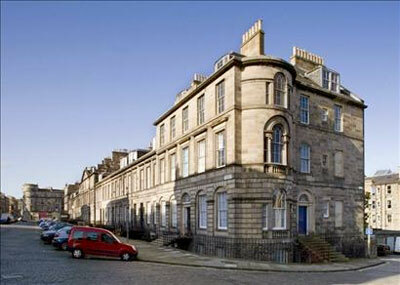 Two bedroom rental accommodation in central Edinburgh. 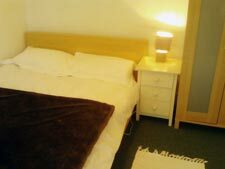 A cosy and quiet self catering apartment in one of the most interesting parts of central Edinburgh. 400m from the new airport tram-stop on York Place. Pevsner's Buildings of Scotland, Edinburgh. 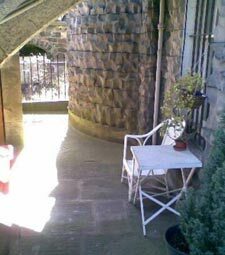 Down old stone steps on the corner of Broughton Place is the front door of Wendy Robertson's flat where she welcomes self-catering guests. There are two bedrooms and one bathroom plus a second wc. 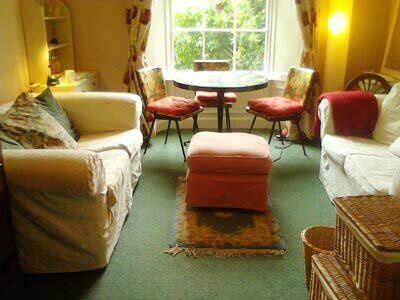 All in all the apartment is calmly decorated, homely, informal and quiet. This piece of Georgian Edinburgh was built in 1809. 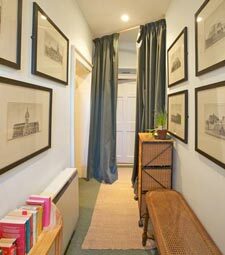 You can hardly hear any traffic noise here, yet the apartment is only 10 minutes walk from Princes Street and Waverley Station and even closer to Harvey Nichols and the smart shops around St Andrews Square. The surrounding Georgian "village" of Broughton is a relaxed residential area and there are small shops, cafés and bars around about, and the famous Italian Deli Valvona and Crolla is just a couple of hundred yards away. Wendy is delighted to advise on sights to see within Edinburgh and further afield. 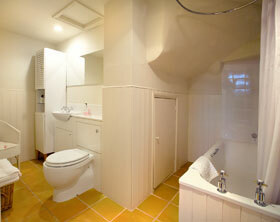 Above and right; Double Bedroom and bathroom with bath, shower over, basin and wc. Below right; Two views of the smaller double bedrooom. 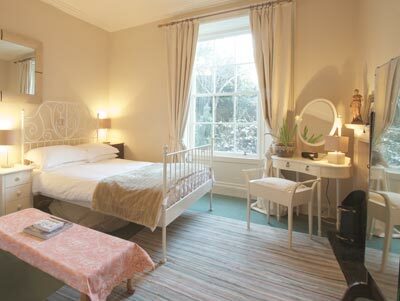 The larger double bedroom looks onto a garden. The smaller onto the flat's private patio. There is also another wc with handbasin. "This is a lovely house with good location and amazing landscape outside the window. 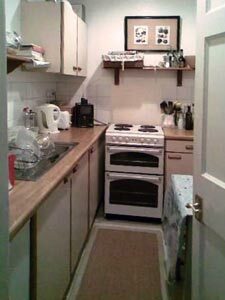 The bathroom and kitchen are full equipped and I enjoyed the holiday with my parents and friends." 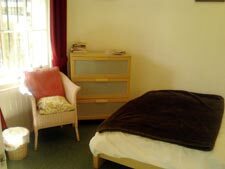 "Even before we arrived Wendy contacted us to make sure we knew how to get there and to arrange for us to meet at the flat. She went out of her way to help us feel at home and allowed us to keep our bags in the flat beyond our "official stay". The apartment is cosy and well appointed. Here too, we noticed Wendy's touch, with an abundance of interesting books and magazines, tea & coffee things and more. The whole stay at Wendy's place was very accommodating and personal." 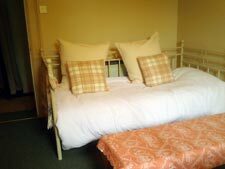 "Me and two friends stayed a small week at the cosy flat. It was really great. Enough space for the three of us, some extra freedom that a hotel doesn't have like the kitchen/livingroom etc. And it was close to the city centre. I would like to thank Wendy for her hospitality and the great appartment." Payment by cash, UK cheque or Paypal. Please tell Wendy you found Number 34 through About Scotland!